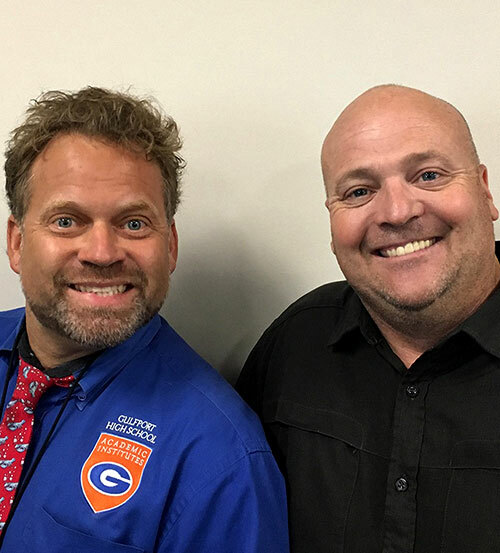 Gerald Huffman has taught Construction Technology at Gulfport High School for the past 5 years. Prior to teaching, he spent 23 years in the US Air Force Civil Engineering Division as a Structures Specialist. Like many servicemembers, he developed a number of trades skills during his time in the military: sheet metal design, layout and fabrication, welding, masonry, carpentry, project management and many others. Patrick Wadsworth teaches STEM English, Technical Writing, and Oral Communication. He has a B.A. from the University of South Alabama and a Masters in Education Administration from Northwestern State University. He was recruited for the Gulfport STEM Institute 4 years ago for his cross curricular certifications and science experience. This is his 19th year of teaching in Mississippi. Gulfport High School was the first public high school in Mississippi to launch the Academic Institutes, a mix of intensive academic curriculum and career-focused, project-based learning to help students navigate their way to greater success after graduation—whether in higher education or in the workforce. Due in part to this innovative structure, students have the ability to complete the majority of the minimum requirements for graduation in the state, this allows for more flexible learning options during their junior and senior years. The school has strong ACT scores and an 87% graduation rate. The Construction Technology program at Gulfport is certified by the National Center for Construction Education and Research (NCCER), a nationally accredited career pathway organization for construction. Students are regularly connected to industry partners in various parts of the construction world — shipbuilding, manufacturing, and fabrication, among others. Construction Technology students are encouraged to apply their skills to imagine, research, design, collaborate on and build complex projects.